Do Truckers Still Use CB Radios? With the advent of 4G wireless networks and the increasing integration of smart technology into every aspect of life, the fates of a good many “old guard” communications systems are understandably up in the air. This really hit home for most people when pagers and large-scale use of fax machines surreptitiously vanished in the last decade. We naturally anticipate this to be the fate of other old standbys, such as CB radio, as the internet becomes accessible virtually anywhere and our environments become increasingly “smarter”. Popular with the general public starting in the 1970s, CB radio technology has been a long-time dependency of heavy freight transport, most especially trucking. It’s hard to mentally separate the romanticized image of truckers portrayed by cinema and TV from this technology. The question is, do truckers still use CB radios? They most certainly own smartphones, and with exceptions, there are few modern semis that don’t have the modern amenities to integrate them. Providing instant emergency communications, reliable GPS and traffic reports as well as instant knowledge about services available where they are, truckers won’t argue they don’t live this technology. It certainly makes their jobs easier, and their life on the road much more enjoyable. Surely there’s no place for the limited and comparably primitive CB radio in this 21st century truck cab, right? Well, that’s definitely where things are headed in the long run, but the new technologies have a long way to go before that really happens. While internet becomes more and more available in rural areas via cellular data connections, this in no way means it’s easy to get a connection in the truly sparse, remote parts of the world. Towers tend to be built when there’s obvious profitability in installing them. Over the past decade, demand for wireless data connections has resulted in towers being proliferated in much of America’s countryside. Unfortunately, the truly wilderness regions are too sparsely populated (and satellite internet too affordable) for there to be enough demand presently to expand the cellular networks into these places. The problem for truckers is pretty obvious. Anyone who’s taken a cross-country trip by car, bus or train knows just how vast and mostly empty North America truly is. As beautiful and diverse as these tracts of wilderness may be, they may as well be the dark side of the moon as far as cellular reception is concerned. Sure, GPS may still work with some phones due to direct satellite connections (though dedicated devices are more reliable in this department), data and communications are more often than not unavailable. Truckers need a dependable way to communicate with one another and authorities, no matter where they find themselves. Breakdowns or accidents could result in loss of freight or worse, death of the driver if they can’t call out for help. Optimal routes become nigh impossible to implement when they have no way of knowing if accidents, bad traffic conditions or road issues are present. For now, while we await the eventual and inevitable expansion of wireless internet even to the most remote reaches of this beautiful continent, old fashioned analog radio remains the king of communications out there. The advantages of CB radio are the lack of a need for relay towers and servers to bounce digital signals around. With no infrastructure to fail, CB radios pretty much always work. This means they’re quite ubiquitous on isolated farms, ranches, small settlements and outposts of civilization in such isolated places. While the range of CB is limited to the distance the waves can travel and remain intelligible, someone is almost always listening, and can be reached in a reasonably short period of time. This is a vital lifeline for truckers, when they can’t rely on their cell phones to locate service stops, get weather and road conditions reports or get help when they sorely need it. 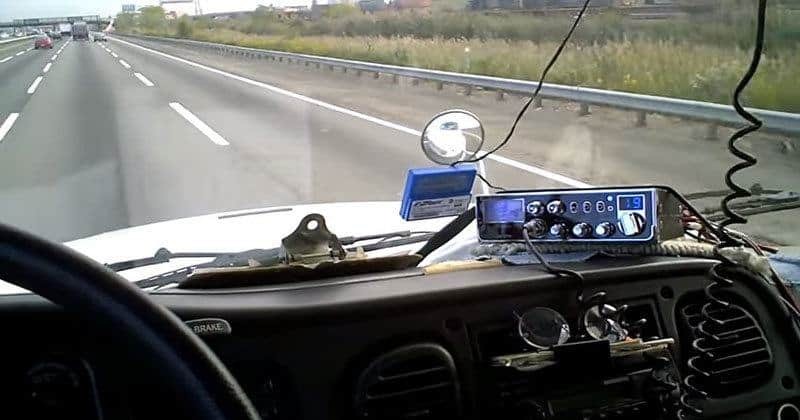 There are also a couple human elements to consider that, while not as huge factors as limited infrastructure, also play a big part in CB radios sticking around with truckers for the time being. Operating a smart phone while driving is a very dangerous proposal that is in fact illegal to do unless in a hands-free way. Voice recognition has come a long way, but for now it’s far less intuitive and reliable. Turning a dial to select a channel, grabbing a receiver single handedly and speaking short, concise messages guaranteed to be heard by someone after enough attempts is safer and simply easier to do. Finally, there’s the psychological element. Trucking is a somewhat lonely and dangerous profession. The peace of mind and reduced isolation possible with such a fail-proof communications system is vital. A trucker knows he can always get in touch with another human being if they’re patient enough to maybe make a few attempts. This provides a sense of safety and a sense of community vital to mental and emotional health. In the future – who knows exactly how distant – truckers probably won’t use CB radios on a regular basis like they still do presently. Data connections of respectable speed and reliability will inevitably exist even in the most distant stretches of North America and indeed other parts of the world too. Even in that new age, though, truckers will probably have good old CB radios on standby because sometimes 4G internet just likes to decide not to work.